“Our people are very lucky to be here,” says Albert White Hat Sr. He has lived through a time when Indians were sent to boarding schools and were not permitted to practice their own rituals. Although the Lakota people can practice their beliefs openly once again, things have changed and old ways have been forgotten. As a teacher at Sinte Gleska University in South Dakota, White Hat seeks to preserve the link the Lakota people have with their past. In Life’s Journey—Zuya, White Hat has collected and translated the stories of medicine men, retaining the simplicity of their language so as not to interpret their words through a Western lens. This is Zuya, oral history that is lived and handed down over the generations. White Hat also shares stories from his own experience. Using anecdotes he shows not only how the Lakota lifestyle has been altered but also how Lakota words have begun to take on new meanings that lack their original connotations and generate a different picture of Lakota philosophy. Language, interwoven with history, tells the people where they came from and who they are. By gathering the traditions and ceremonies in a single volume, with the history of how they evolved, he has secured the meaning of these practices for futre generations. Filled with warmth and humor, Life’s Journey—Zuya is an enjoyable and enlightening read. Born and raised on the Rosebud Sioux Reservation in South Dakota, Albert White Hat Sr. has lived there his entire life, teaching in the Lakota Studies Department at Sinte Gleska University for more than 25 years. As the grandson of Chief Hollow Horn Bear and member of the Aske Glu wipi i tiospaye, he continues to promote education and awareness for his people in the 21st century while maintaining a traditional way of life. 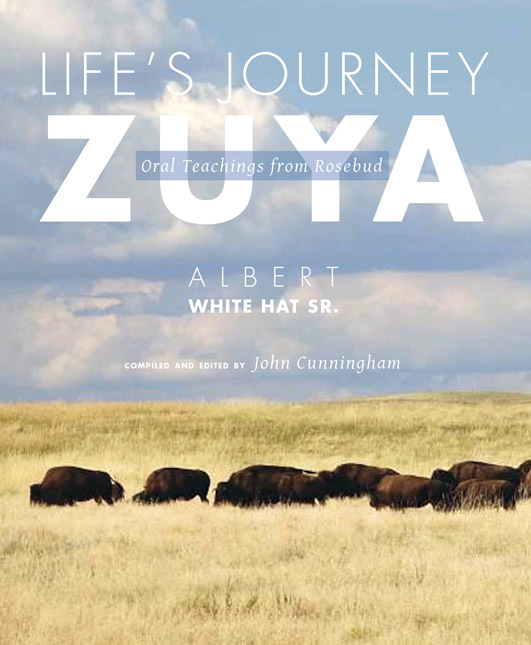 Life’s Journey—Zuya is his second book, following Reading and Writing the Lakota Language (The University of Utah Press, 1999). John Cunningham lives in Boulder, Colorado, with his wife, Cindy, and his daughter, Catherine. He is an avid hiker and is happiest outdoors.